Capture brilliant photos and Full HD 1080p video of pygmy seahorses, sharks, and coral reefs, thanks to Aquatica's AD800 Underwater Housing for your Nikon D800 or D800E digital SLR camera. It has a depth rating of 295' (90m), which is upgradeable to 426.5' (130m). The housing is equipped with a pair of fiber-optic strobe connectors, along with adapters for attaching 2 optional Sea & Sea or Inon-type strobes. Access to virtually all camera functions is provided by mechanical controls. 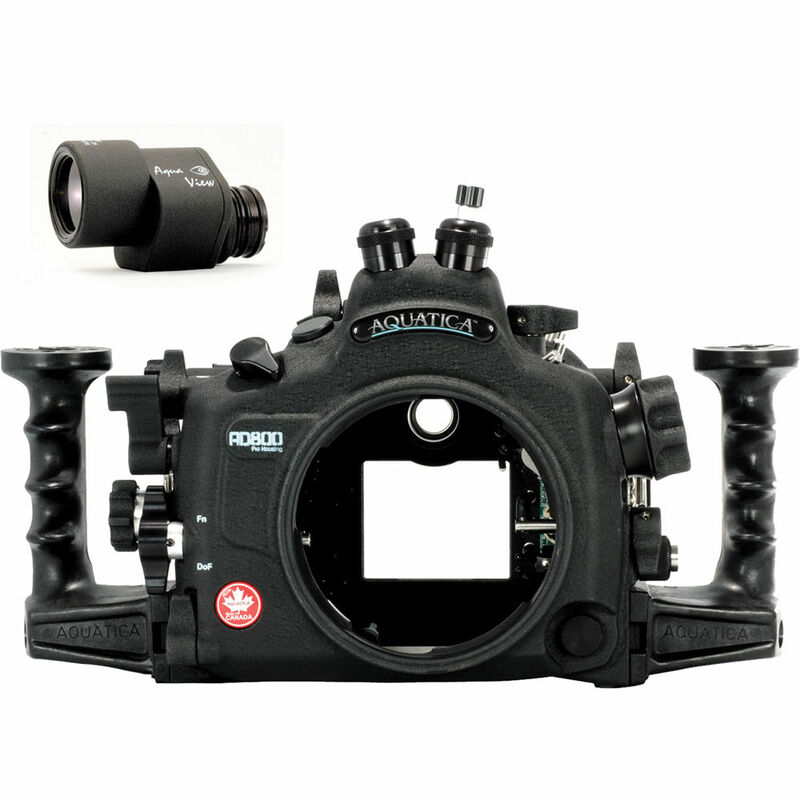 The AD800 housing is the first of its kind from Aquatica to offer access to the Fn and DOF preview buttons. This is accomplished via a unique toggle lever. Various custom functions can be assigned to each of these buttons. The AD800 has dual ergonomic hand grips for easy underwater handling. The housing is constructed from aircraft grade aluminum and stainless steel for durability. It is machined on advanced, 5-axis, computer-assisted machines, then anodized to North American military specifications to safeguard against corrosion, scratches, and other damage. A tough powder coating and corrosion-resistant zinc anodes on a couple of sensitive parts round out the noteworthy protective features of the AD800. for full compatibility information. The standard, coated eyepiece offers a full view of the camera's viewfinder, and the coated Aqua View Finder, also included, offers an enlarged, enhanced view with 100% coverage, corner-to-corner sharpness, and dioptric adjustment.